Legal news for medical malpractice attorneys – Improvements in patient safety are lagging, according to the Annual Quality and Disparities Report. Instances of postoperative sepsis increased by 8 percent in 2009. Rockville, MD (www.NewYorkInjuryNews.com) – A recently released statement from the Agency for Healthcare Research and Quality, (AHRQ) www.ahrq.gov, claimed that rates of health care-related infections have increased. AHRQ’s information was obtained from the 2009 National Healthcare Quality Report and National Healthcare Disparities Report. Five types of infections were tracked for the report. The rate of postoperative sepsis increased by eight percent in 2009. 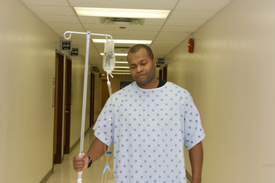 Postoperative catheter-associated urinary tract infections rose by 3.6 percent. The instances of selected infections due to medical care increased by 1.6 percent and the number of bloodstream infections associated with central venous catheter placements remained the same. The one infection rate that fell was postoperative pnemonia, which saw a 12 percent improvement. Furthermore, blacks, Hispanics, Asians and American Indians were less prone than whites to receive preventative antibiotics before operations in a timely manner. The report gave example as to how easily preventable these infections are by mentioning, “Over 100 participating hospital intensive care units in Michigan have been able to keep the rates of central line-associated bloodstream infections to near zero, three years after adopting standardized procedures.” The program referenced was conducted by the Michigan Health and Hospital Association Keystone Center and involved the used of a comprehensive safety program to reduce infections. The complete reports are available online at http://www.ahrg.gov/qual/grdr09.htm. Legal News Reporter: Tara Monks – Legal news for medical malpractice attorneys.